Transform your look with mineral makeup. Mineral foundation is one of the biggest beauty stories around right now, it’s changing our expectations of makeup by enabling every woman to achieve a dewy, flawless effect, whilst also being kind to her skin. Mineral makeup is mainly about powders, but you can find liquid formulas which are mineral. The best version will depend on your skin type, if you’re prone to oily patches then go for powered, but if you have dry skin, a liquid mineral foundation will leave it feeling hydrated and supple. 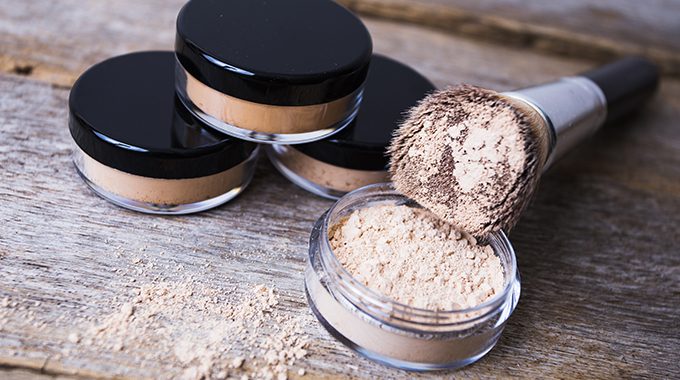 Women choose mineral foundation as an alternative to traditional makeup for several reasons, most importantly it does not contain chemical preservatives and filters like talc. It also lacks any artificial oils, colours or perfumes – which are a common cause of skin irritation. The lack of these artificial products is thought to be what makes it so good for your skin. Instead of just providing a basic coverage, the combination of titanium dioxide, zinc oxide, natural filters and mica, have a calming effect. These ingredients deliver a host of anti-inflammatory properties, making mineral makeup ideal if you’ve recently had a chemical peel, or you suffer from a condition like rosacea, acne or eczema. Furthermore, zinc oxide and titanium dioxide are sunscreen ingredients, so you’ll also gain a degree of protection from UV rays. Applying mineral makeup wet or dry. Mineral makeup has different qualities to conventional makeup, so you’ll need to use a different technique when applying it. Primarily, it’s vital to bear in mind that a very small amount of mineral foundation will go a long way. Start by applying the foundation with a brush, building up to the kind of coverage you prefer in sheer layers. Each time you refresh the brush, tap it gently on the pot to avoid uneven patches. Go slow, as it’s far easier to apply more layers than it is to remove everything and start again. For a fuller coverage, you can apply mineral foundation onto your skin whilst it’s wet. Start by tapping out some of the powder into the lid of your makeup pot and mist it with distilled water. Then do the same to your makeup brush, leaving it just slightly damp. Dip the brush into the foundation and sweep down your skin in one motion, then repeat until you have the desired level of coverage. Mineral makeup for oily skin. As a mineral makeup, this foundation is specially formulated to be non-comedogenic, it will not clog pores or encourage blemishes to pop up, unlike many other products on the market. As well as being long-wearing, mineral makeup is also capable of absorbing excess oil. So, if your skin remains prone to shiny patches even after you’ve applied your makeup, mineral foundation should be your go-to product for an immaculate completion. As with all products, it’s best to shop around to find the perfect mineral foundation, but when that happens, you’ll never turn back.